Production: United Artists; black and white, 35mm; running time: 93 minutes. Released 1955. Producer: Paul Gregory; screenplay: James Agee, rewritten by Charles Laughton, from the novel by Davis Grubb; photography: Stanley Cortez; editor: Robert Golden; art director: Hilyard Brown; set decorator: Al Spencer; music: Walter Schumann; special effects: Jack Rabin and Louis De Witt. Cast: Robert Mitchum ( "Preacher" Harry Powell ); Shelley Winters ( Willa Harper ); Lillian Gish ( Rachel ); Billy Chapin ( John ); Sally Jane Bruce ( Pearl ); Peter Graves ( Ben Harper ); Evelyn Varden ( Icey Spoon ); Don Beddoe ( Walt Spoon ); James Gleason ( Uncle Birdie ); Gloria Castillo ( Ruby ). Agee, James, Night of the Hunter , in Agee on Film 2 , New York, 1960. Brown, William, Charles Laughton: A Pictorial Treasury of His Films , New York, 1970. Burrows, Michael, Charles Laughton and Frederic March , Cornwall, 1970. Higham, Charles, Charles Laughton: An Intimate Biography , New York, 1976. Matthews, J. H., Surrealism and American Feature Films , Boston, 1979. Lanchester, Elsa, Elsa Lanchester Herself , New York, 1983. Callow, Simon, Charles Laughton: A Difficult Actor , London, 1987, 1989, 1997. Roberts, Jerry, Robert Mitchum: A Bio-Bibliography , Westport, 1992. Marill, Alvin H., The Films of Robert Mitchum, Secaucus, New Jersey, 2000. Hart, Henry, in Films in Review (New York), August-September 1955. Archer, Eugene, in Film Culture (New York), Winter 1955. Lambert, Gavin, in Sight and Sound (London), Winter 1955–56. Benayoun, Robert, "Freud au pays de l'ogre," in Demain (Paris), 1956. Truffaut, François, in Arts (Paris), 23 May 1956. Labarthe, André S., in Cahiers du Cinéma (Paris), June 1956. Vermilye, Jerry, "Charles Laughton," in Films in Review (New York), May 1963. Johnson, Ian, and Raymond Durgnat, editors, "Puritans Anonymous," in Motion (London), Autumn 1963. Wood, Robin, " Night of the Hunter : Novel into Film," in On Film , London, 1970. Gow, Gordon, in Films and Filming (London), February 1975.
" La Nuit du chasseur Issue" of Avant-Scène du Cinéma (Paris), 15 February 1978. Hammon, P., "Melmouth in Norman Rockwell Land: The Night of the Hunter ," in Sight and Sound (London), no. 2, 1979. Lucas, Blake, in Magill's Survey of Cinema 3 , Englewood Cliffs, New Jersey, 1980. Ferrario, D., in Cineforum (Bergamo), January-February 1982. Le Pavec, J. P., in Cinéma (Paris), February 1982. Tobin, Yann, in Positif (Paris), May 1982. Turner, G. E., "Creating The Night of the Hunter ," in American Cinematographer (Los Angeles), December 1982. Listener (London), 6 March 1986. Ravage, Jack, "Reviews: The Night of the Hunter ," in Film Quarterly (Berkeley), vol. 42, no. 1, Fall 1988. Trojan, Judith, "Front Row Center: Lillian Gish: The Actor's Life for Me directed by Terry Sanders/ The Night of the Hunter written by James Agee and directed by Charles Laughton with Lillian Gish and Robert Mitchum," in Wilson Library (Bronx), vol. 63, no. 6, February 1989. Rainer, Peter, "The Best Movies on Video You've Never Seen: The Night of the Hunter Directed by Charles Laughton," in Connoisseur (New York), vol. 221, no. 951, April 1991. Secchi, C., "Fiaba e sogno in The Night of the Hunter di Charles Laughton," in Cinema & Cinema (Bologna), May-August 1991. Hoberman, J., "Down by the River," in Village Voice (New York), vol. 37, 28 July 1992. Berthome, J.-P., "Deux voix dans la nuit," in Positif (Paris), July-August 1993. Svehla, G.J., "Robert Mitchum's Cinema of Evil: Cape Fear and Night of the Hunter ," in Midnight Marquee (Baltimore), vol. 46, Winter 1994. Moorhouse, Jocelyn, "Enduring: Night of the Hunter Directed by Charles Laughton," in Sight & Sound (London), vol. 5, no. 4, April 1995. Duras, Marguerite, " La nuit du chasseur ," in Cahiers du Cinéma (Paris), no. 501, April 1996. Gross, Larry, "Baby, I Don't Care," in Sight & Sound (London), vol. 7, no. 9, September 1997. Gee, Maggie, "Songs of the Sweet Enchanter," in TLS: The Times Literary Supplement (London), no. 5009, 2 April 1999. Romney, Jonathan, "Long Shadows," in New Statesman (London), vol. 12, no. 549, 2 April 1999. Thomson, David, "A Child's Demon," in Sight & Sound (London), vol. 9, no. 4, April 1999. Published in 1953, Davis Grubb's Depression-era novel about a serial killer preacher in relentless pursuit of two orphans in order to get a cache of stolen loot in their possession shot to the top of the bestseller list and stayed there for months. The book was brought to the attention of Charles Laughton by the actor's business associate, producer Paul Gregory. Though still in demand as an actor on the stage, Laughton's movie career had hit the skids; he wanted to make the transition to movie director. Gregory thought the book ideal for Laughton's debut effort. James Agee was hired to adapt the book, but his draft proved too unwieldy and unfilmable and Laughton proceeded to adapt the book himself, though he took no screen credit for his work. To prepare for the film, which he wanted to exude an atmosphere of early rural Americana, Laughton screened a collection of silent films by the undisputed master of such atmosphere, D. W. Griffith— then, in a further nod to the master, cast Griffith's greatest leading lady, Lillian Gish, in an important role. 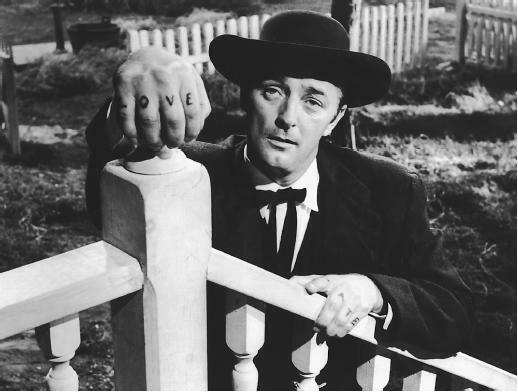 Robert Mitchum was Laughton's first and only choice to play the killer preacher, Harry Powell, whose warring inner demons are symbolized by the words "love" and "hate" tattooed on his knuckles. The released film was a pictorially striking but decidedly unusual combination of picaresque adventure, fairy tale, and psychological thriller that eluded the grasp of most critics, who voted "thumbs down." A box-office failure, it marked not just Laughton's screen directorial debut, but swan song as well. Over the years, however, The Night of the Hunter has come to be viewed as a masterpiece—filmed in a kaleidoscope of styles, ranging from expressionism to film noir to avante-garde, that is breathtakingly cinematic yet boldly theatrical, employing a marvelously intricate and evocative soundtrack and extraordinary music score. Very few first-time film directors have displayed such a natural gift for the medium as Laughton did with The Night of the Hunter ; it's a shame he never had the opportunity to direct another movie. The performances Laughton drew from his cast are remarkable. But the standout performance is Robert Mitchum's; the actor's frequently listless performances in other films often disguise what a fine actor he can be given a guiding hand like Laughton's. His performance as Powell is one of the screen's most chilling portraits of perversity and genuine evil. He is astonishingly persuasive as he gently coaxes orphan Pearl to tell where the money is hidden, then flies into a rage scarily calling her a "poor, silly, disgusting little wretch" when she obeys her brother's instructions to keep silent. And his frustrated cry of sheer animal rage when the skiff carrying the fleeing children slips from his grasp as he wades into the water after them sends a cold breeze from hell up the viewer's spine to this day. So expertly made and definitive is Laughton's memorable screen version of Grubb's novel that it would seem foolhardy for anyone to attempt to remake and improve upon it. But director David Greene tried to do so in a 1991 version made for television, starring a miscast Richard Chamberlain in the Mitchum role. Astonishingly, the remake dispensed with the final third of Grubb's novel wherein Powell is brought to justice by the orphans' savior, a Mother Courage figure named Rachel—a denouement Laughton had brought potently to life with Lillian Gish in the part. Only Diana Scarwid's touching performance as the doomed Willa (played differently but with equal vulnerability by Shelley Winters in the original), the mother of the two children who is killed by Powell rendering them orphans, saved the remake from being worthy of total dismissal—unlike Charles Laughton's version, which remains unforgettable in every way. Night of the Hunter was always a favorite of mine. I would like to know what became of the child stars, Billy Chapin and Sally Jane Bruce. Where/who are they today? ?